In January 2008, a storm blew down a mature sitka spruce in the Forestry Commission plantation at Achnabreck, near Lochgilphead. The falling tree took another three trees down with it, and their root plates lifted the thin layer of soil up with them, leaving a patch of bedrock almost clean. A passer-by named Sally Wilkin noticed cup and ring markings on the bedrock, and reported the find to Kilmartin House Museum. The whole area is full of rock art, with at least two more sites nearby at Achnabreck, another group less than a mile to the west at Cairnbaan, and many more sites in Kilmartin Glen. Little trace remains of Little Sparta. The books in the library were taken into a public collection, maybe digitised before they fell apart, maybe not, their data lost, in any case, within a single human lifetime, to digital obsolescence. A few trees survive, none of them growing particularly old before dying of exposure on this land which always wanted to revert to rough grazing, and did so. None of the ponds ever really wanted to be a pond; they have all dried up and the streams which fed them have returned to their original courses. Maybe a few surreptitious votive offerings, of coins or trilobites or whatever, survive in the soil where the ponds used to be, to mark this as a place of contemplation or wishful thinking. Lochan Eck has dried up too, but its sheer size and the depth of rammed clay beneath it mean that it survives as a crop-mark of sorts, showing up in dry weather as a patch of slightly more lush grass, the shape of an old-fashioned flat-iron seen in perspective. The name Lochan Eck made it onto the OS map, and perhaps some memory of that name might survive, maybe attached to another feature in the landscape once the lochan is gone, maybe processed or mutated through whichever languages, if any, pass this way after Gaelic and English have left. The stones are mostly gone, robbed out and re-used, to patch a dyke or embellish a rockery, or dug up after centuries and placed in a museum, next to the prehistoric and Roman remains of South Lanarkshire, the museum falling to ruin in its turn, resurfacing after yet more centuries as a curated assemblage of objects which makes no historical sense at all. The foundations of the farm buildings remain, and this place will probably be read as a farm, ornamented or not. The barn that was once a thrashing mill, then a ruin, then a walled garden, will be read as a barn. The people who lived here will be known by what they threw away. The main focus of archaeological interest will be the disused quarry to the south east of Stonypath, used as a rubbish dump by the farmer and others, with layers of compacted agricultural refuse and one narrow stratum of late 20th century stuff, maybe children’s toys, maybe adults’; small plastic things that will never biodegrade, glass marbles, model tanks. it kept to its ripening in autumn. 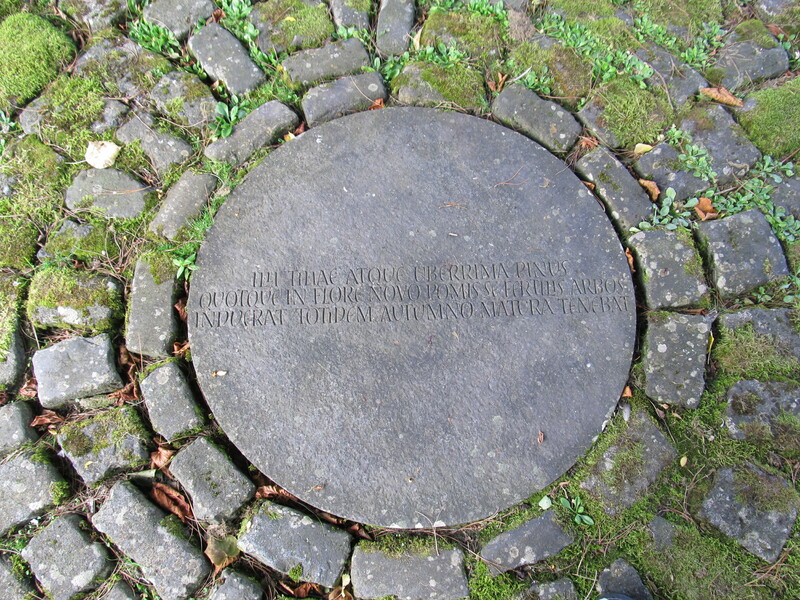 The soil around the plaque holds traces of many other trees, generation after generation of lime tree and pine, at one time a closely-packed circle of trees, each acting as a windbreak to shelter its neighbour from the worst of the effects of the fresh air. The trees slowly built up a thick layer of leaf mould, burying the plaque, and the circle of trees became a clump, which gradually thinned out, until only the one old lime tree remained, out on its own and vulnerable to the Pentland storms. When it fell, a gravestone appeared with its name on it. There’s a person there too, rendered namelessly by a Latin pronoun, ILLI — and if Virgil survives, we will know that nameless pronoun for an old man who built a garden on a few acres of neglected land. Thanks are due to the Little Sparta Trust for this residency, part of the Sharing Little Sparta programme. My particular thanks to Alexia Holt, Laura Robertson and George Gilliland. Thanks also to Julie Johnstone at the Scottish Poetry Library, and to the Mitchell Library in Glasgow for access to the Finlay works in their collections. I’ve got a lot out of conversations with David Bellingham, Thomas A. Clark, Alec Finlay, Gerry Loose and Sarah Rose. This entry was posted in sharing little sparta, Uncategorized and tagged sharing little sparta on 26/09/2016 by Peter Manson. 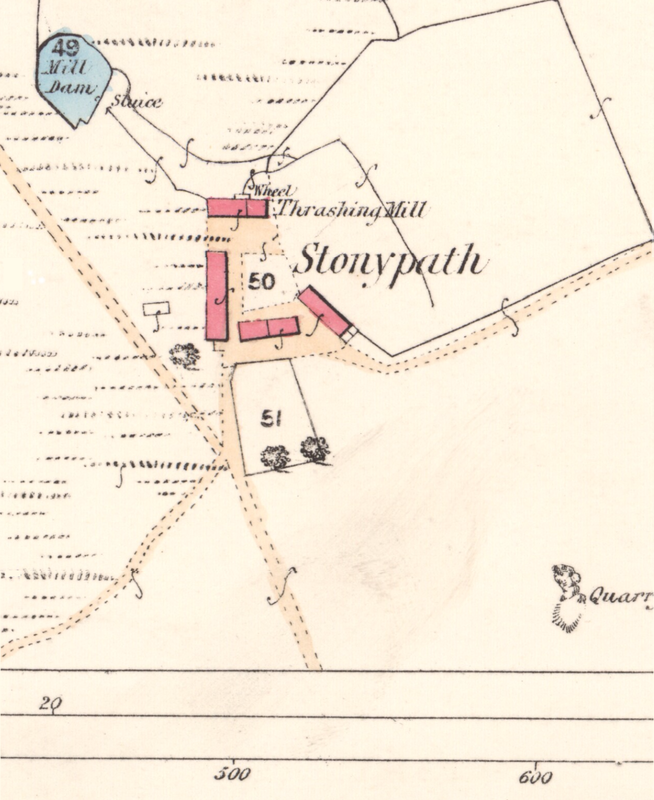 I found a much more detailed 25 inch OS map of Stonypath on the NLS website: Lanark Sheet XXI.14 (Dunsyre). Survey date: 1859 Publication date: 1864. Click on the image for a bigger version. The thrashing mill would have occupied the old barn which is now a hortus conclusus, the last work planned by Finlay for Little Sparta, and realised after his death. Notice the multiple instances of the long S symbol, a mirror-image of Finlay’s beloved proofreading symbol for transposition of letters. These are “area brace” symbols, showing that the lands on either side of a linear feature (stream, fence, path etc.) were part of the same parcel of land. This entry was posted in sharing little sparta and tagged sharing little sparta on 24/09/2016 by Peter Manson. 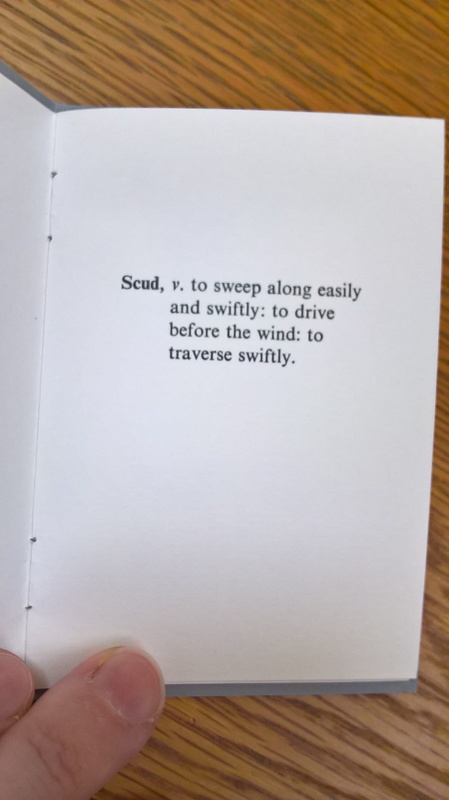 Ian Hamilton Finlay, He Spoke Like an Axe (with Richard Healy, 1984). It’s hard to learn about the French Revolution or the Third Reich from Finlay’s work, though you do end up learning about them, if you have any curiosity at all. It’s not quite enough to say that these are things that were once common knowledge and that dropped out of public awareness quite recently. That works, up to a point, with the Classical references — far more people of Finlay’s generation than mine would have known Latin and read Ovid and Virgil, though the ones who did would probably have gone to grammar schools or private ones. Finlay’s other focal interests seem much more idiosyncratic, or at least the kind of focus that he brings to bear on them seems to force much of the rest of the world into a blurred margin. That may be a generational thing, unavoidable if you were born in 1925, bombed as a kid and conscripted before the end of the war — I think of the way the Second World War pops up again and again in Spike Milligan’s television comedy of the 1970s, with Hitler lampooned in every episode as if he was still a contemporary. Fingers: model’s own. There’s a weird kind of double disconnect here, both from the deadly seriousness of the actual mass bombing, and from the language itself (people did find the word Scud funny — for younger viewers, it’s the name of a missile — but those two definitions weren’t what they were laughing at). I find that booklet amazingly upsetting. 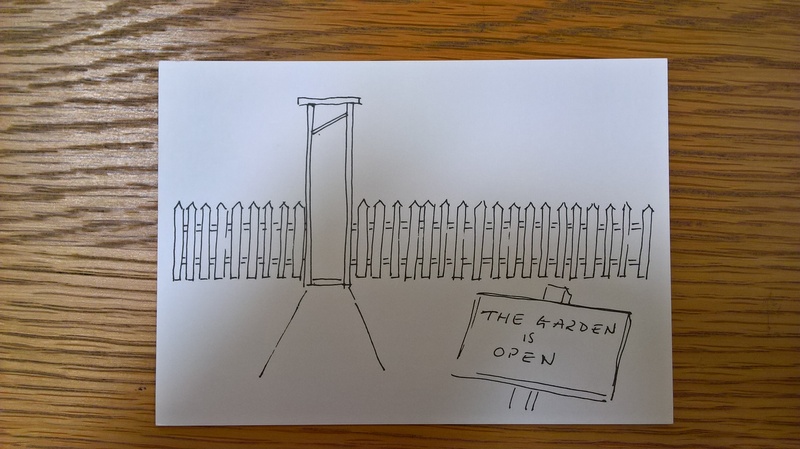 (This is an early response to the mention of Stonypath in the National Trust Guide to Follies, whose editors found the garden insufficiently “manly” for their tastes. Finlay made at least seven other artworks against the Guide, and this was a fairly minor skirmish in a long and angry decade). Too often in the 1980s, Finlay seems like a man who has taken a vow of silence which he tries to circumvent by holding up incendiary placards. It can’t have been that frightening to be on the receiving end of this ire — the publications still read as calculated formal gestures, almost always involving visual artist collaborators — but you sense that Finlay wants them to strike home in a way they rarely do, and you sense the frustration and hurt behind them, channelled into more and more self-defeatingly aggressive works. 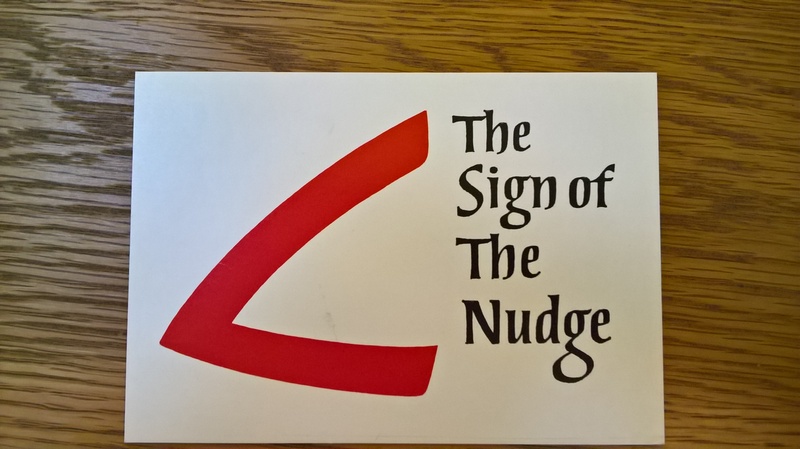 It’s a gently apocalyptic literal nudge, intended to encourage recipients who owed Finlay money to pay up. The crooked elbow is also a scythe (a shape that takes part in an incredibly complex network of metamorphoses in Finlay’s later work), but I can’t help thinking it looks like a boomerang too. If your boomerang comes back, you know it hasn’t hit anything but you. It didn’t have to be like that. Finlay was capable of immensely subtle responses to the work of artists he respected but didn’t quite agree with. It took me several visits to Little Sparta before I realised there was a homage to Mallarmé in the garden — a cinerary urn in Portland stone, with the inscription “VNE OEVVRE PURE” (carved by Nicholas Sloan, c.1982). The reference is to Mallarmé’s essay “Crise de vers”, the quote “L’oeuvre pure implique la disparition élocutoire du poète, qui cède l’initiative aux mots, par le heurt de leur inégalité mobilisés; ils s’allument de reflets réciproques comme une virtuelle traînée de feux sur des pierreries, remplaçant la respiration perceptible en l’ancien souffle lyrique ou la direction personnelle enthousiaste de la phrase” [“The pure work implies the disappearance of the poet as speaker, who cedes the initiative to the words, mobilised by the clash of their inequality; they illuminate one another with reciprocal reflections like a virtual trail of light upon precious stones, replacing the respiration perceptible in the old lyric breath or the enthusiastic personal directing of the sentence”]. Finlay, like Mallarmé, was a seeker after a certain kind of purity in art, but the disappearance of the poet as speaker implies death — maybe the really pure work would prove as inert as our ashes. Finlay was anything but a sound poet, stressing that any apparently rhythmic repetitions in his early visual poems were a kind of silent patterning meant for the eye, not calling to be voiced. 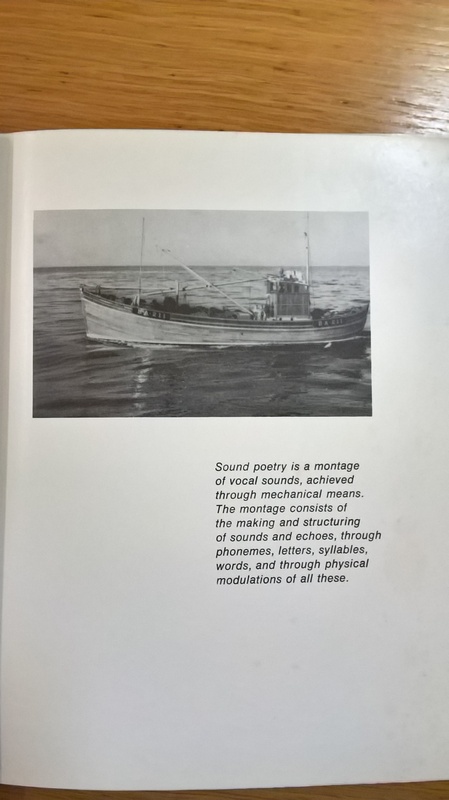 He liked Schwitters, though — for his humour, his domesticity and, here, for the parallel between Schwitters’s jawbreaking consonant clusters and Finlay’s own fascination with the letter codes painted on fishing boats, a kind of abstract sound poetry linking them to their ports of origin. It’s a book of silent pictures of often stormy seas (the cover shows a turbulent sea and sky with no boats visible). The sounds of wind (through trees) and (falling) water were the only sounds engineered into the garden at Little Sparta, and there’s a playful sense here of the theorisings of the sound poets being outpractised by nature. Schwitters, de Vree and Jandl are all at sea, but only Finlay knows how to sail a boat. This entry was posted in sharing little sparta and tagged sharing little sparta on 23/09/2016 by Peter Manson. What I like most about Finlay is the way he manages to sidestep the decorative use of metaphor and simile, instead reinventing metaphor as something more like literal transformation. His first book of poems, The Dancers Inherit the Party, manages to be both plain-spoken and gently surreal — the strangeness is partly in the off-kilter negotiation of the often rhymed forms, partly in the precarious comic bleakness of the lives in it and the landscapes they have to make the best of. These are the poems that drew an immediate response from American poets like Robert Creeley, Lorine Niedecker and Louis Zukofsky — Niedecker at first thought he must have read some of her early poems. That’s how influence works, of course. You don’t start writing in a particular way because you’ve read somebody’s poetry, you find yourself reading and responding to that poetry because you’ve arrived at a point in your own writing where you’re able to understand how it works from inside. The Dancers is subtitled “Selected Poems by Ian Hamilton Finlay”. Not many first books of poetry come with the label “Selected Poems” — it’s a double signal, telling us he has significant history as a poet (there’s a poem in the UCP Selections dated 1948), but also that he’s drawing a line here, summing things up, and has already moved on to a different kind of writing. 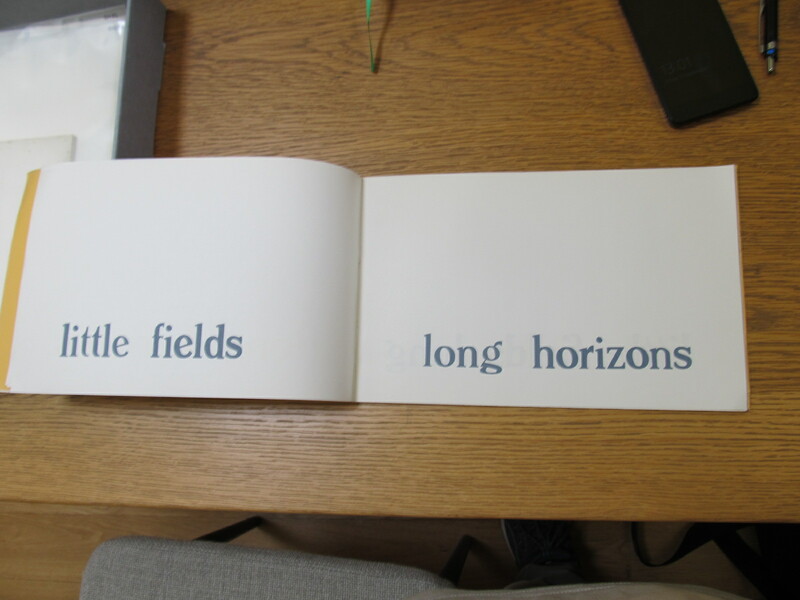 It’s somehow more immediately there in the process of turning these pages than in its incarnation at Little Sparta, where one pair of inscribed drystone walls gives way to another, horizon after horizon, as you walk through, with an actual horizon for afters. When a given poem exists both as a paper publication and a structure in the garden, it’s often the paper version that is the more self-contained object. 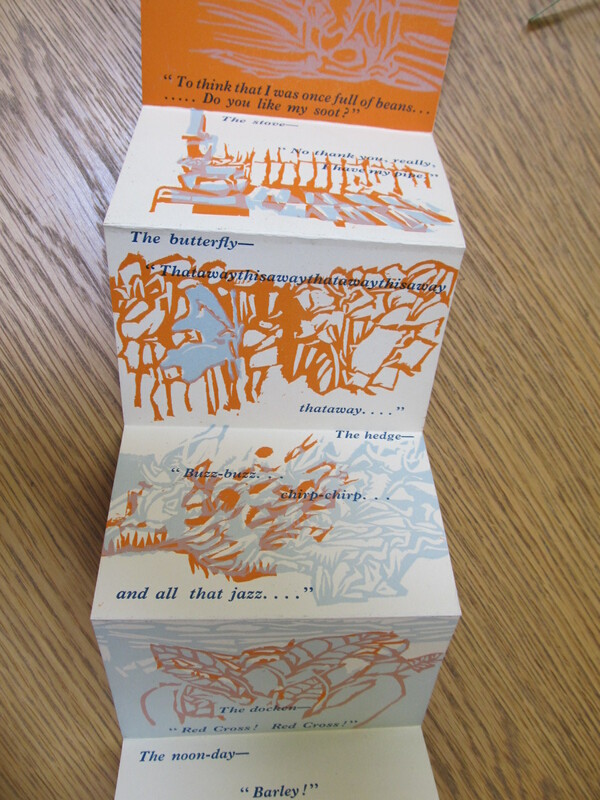 Finlay often adds a line or two of contextualising information, at the end of the booklet or on the back of the card, some essential reference that makes the work jolt into meaning. You can’t really do that with a piece of sculpture in a garden, so part of the meaning of the works at Little Sparta has to be brought to them from outside, whether from the Visual Primer or by a friend in the know. There’s a kind of “Ah!” that you hear often at Little Sparta, the sound of someone suddenly getting the reference — I’ve emitted that sound, and I’ve caused a few other people to emit it in their turn, but I have awful problems with that “Ah!” It feels too much like the reaction to a punchline, too much like the moment when the physicality of the artwork evaporates and is replaced by an idea. It’s seductive to find yourself able to unlock a work of art for another person, but I also sometimes feel drawn into an uncomfortable complicity with the work. Finlay’s art invites explication, and clearly benefits from it, while most of the art and writing I love best is deeply resistant to explication, and tends to make the critical work that surrounds it look obviously inadequate or partial or forced. I suppose my basic working fantasy as a language artist is that I might be able to make a work of some complexity whose meaning would largely arise from the shared matter of the language, the meanings of words that we could all be expected to know and their patterned interaction as the poem, a thing to be sounded out time and again but never completely known, not replaceable by anyone’s idea of it. Maybe Little Sparta makes me uncomfortable because it knows that my working fantasy is a fantasy, and an self-isolating one at that. We bring an immense amount of culturally-specific knowledge to everything and everyone we interact with, and Finlay’s work is completely honest about that. Feeling the pressure to share what knowledge we have, and feeling pleasure in passing it on, is a mark of our being alive to our own enjoyment, not a sign that we’ve entered a clique. The missing data in Little Sparta mark the points where the garden becomes a social space, and those “Ah!”s are entirely convivial. This entry was posted in sharing little sparta, Uncategorized and tagged sharing little sparta on 19/09/2016 by Peter Manson. 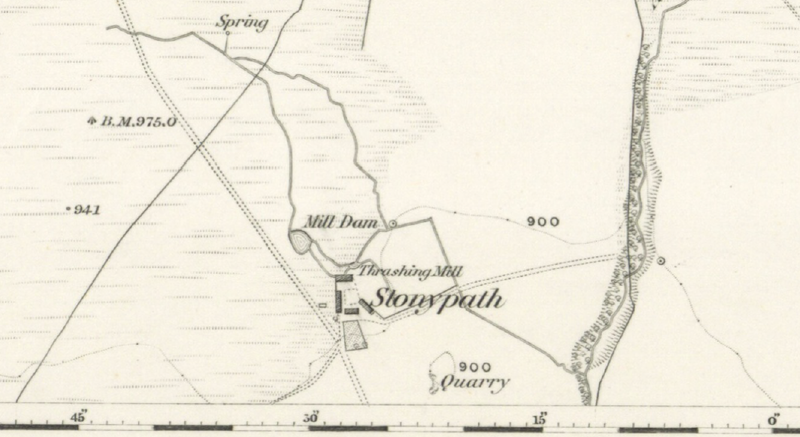 Stonypath from the 6 inch OS map of Lanarkshire (Sheet 21, surveyed 1859, published 1864), showing mill dam and thrashing mill. From A Topographical Dictionary of Scotland, and of the Islands in the British Seas, vol 1. London: Nicol, 1813. From The New Statistical Account of Scotland, vol VI (Lanark). Edinburgh: Blackwood, 1845. 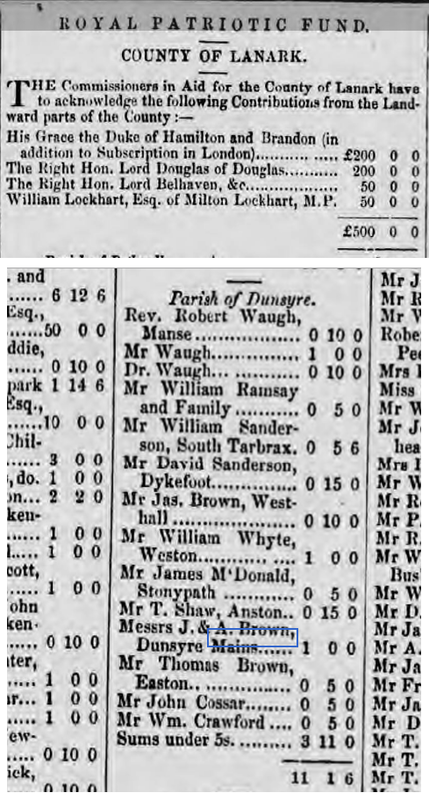 From the Glasgow Herald, 18 December 1854. Mr James McDonald of Stonypath contributes 5 shillings to the Royal Patriotic Fund for the Crimean War. 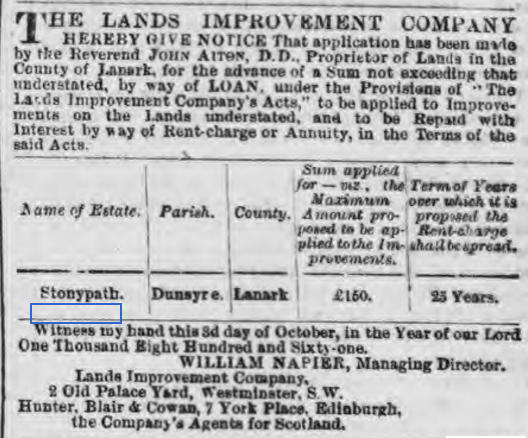 From the Glasgow Herald, 17 October 1861, notice of a land improvement loan for Stonypath. 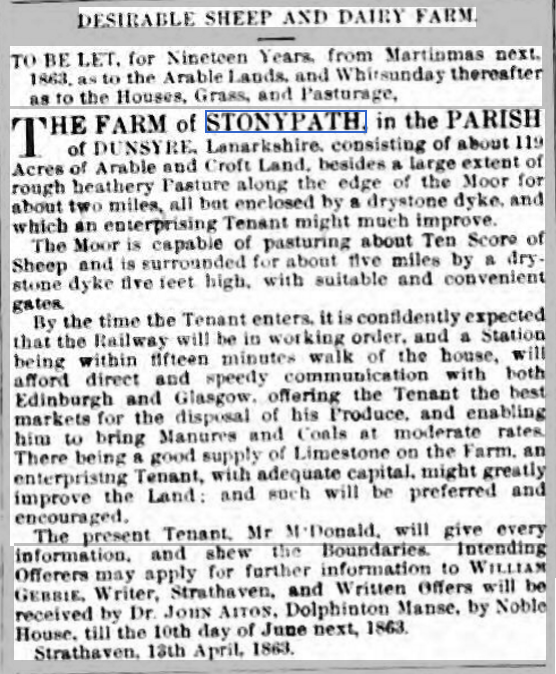 From the Hamilton Advertiser, 18 April 1863: Stonypath farm to let. Railway coming soon. From the Hamilton Advertiser, 19 September 1863, sale of oats at Stonypath. 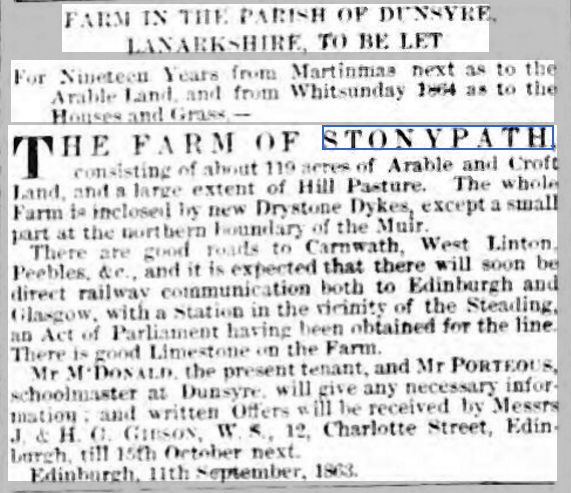 From the Hamilton Advertiser, 3 October 1863, Stonypath farm to let. 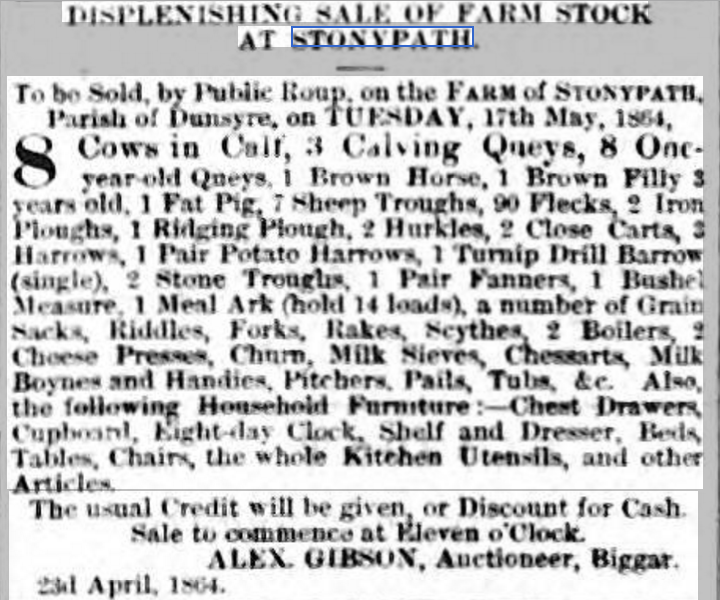 From the Hamilton Advertiser, 30 April 1864, Displenishing sale of farm stock at Stonypath. 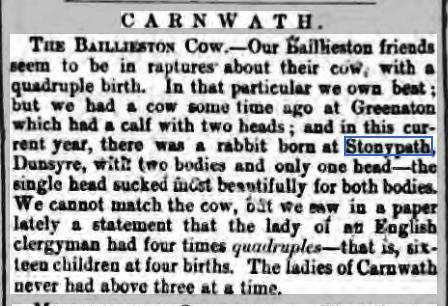 From the Hamilton Advertiser, 2 April 1870, two-bodied rabbit born at Stonypath. From Transactions of the Society of Antiquaries of Scotland, vol 3 (1881), notice of a donation to the Society by Mr. James Graham of Stonypath. 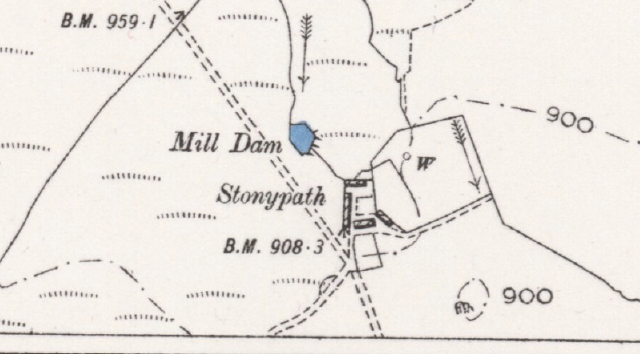 Stonypath from the 6 inch OS map of Lanarkshire (Sheet 21, revised 1896, published 1899), still showing mill dam. 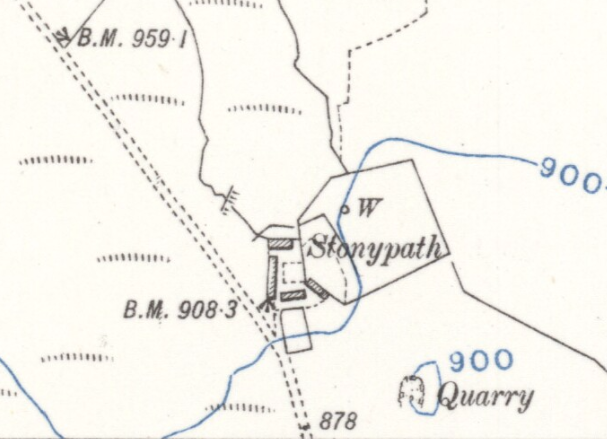 Stonypath from the 6 inch OS map of Lanarkshire (Sheet 21, revised 1910, published 1912). Mill pond seems to have gone. This entry was posted in sharing little sparta and tagged sharing little sparta on 13/09/2016 by Peter Manson. — it’s the least self-important self-description imaginable, telling us what they do rather than what they are. Maybe it didn’t quite feel like publishing. So many of these presses functioned as part of an international exchange network — magazines like Migrant which didn’t really do subscriptions, you just sent a postcard and were added to the list, though donations were welcome and, if you were a writer, you probably sent your own books and magazines in return. 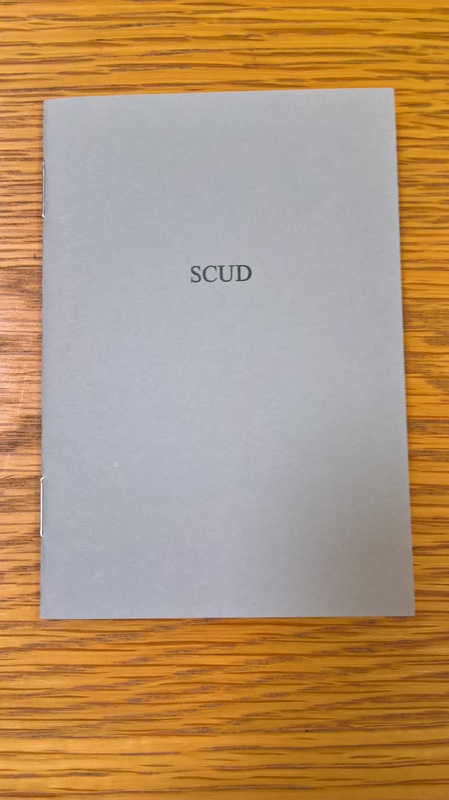 It was still just about possible to run a little magazine of this kind entirely by snail mail in the 1990s, when Robin Purves and I edited Object Permanence. 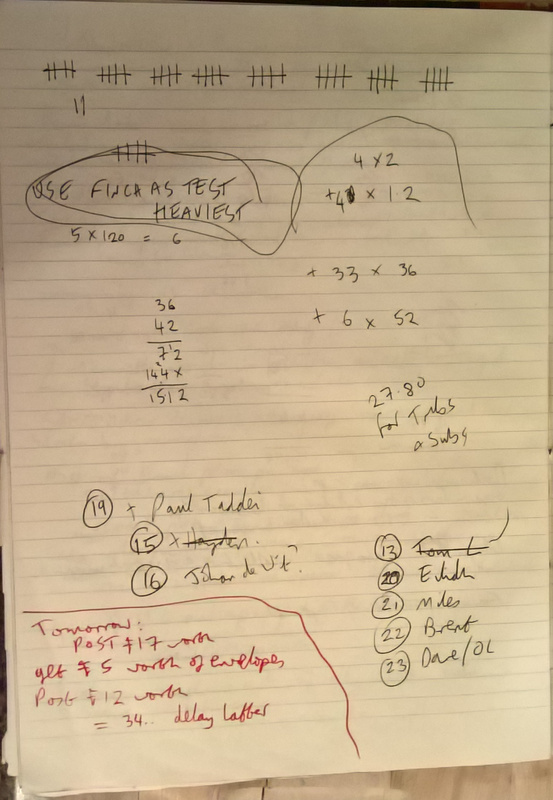 I still have a notebook full of postage calculations, what I could afford to post out this week and what would have to wait. Postage costs, especially international postage, have increased so much that it would be very hard to make a magazine the same way now, without funding. People find ways to do it, of course: publications can be made very small and light, bigger publications can now be printed on demand in the buyer’s own country, and increasingly, whole print runs cross the Atlantic in poets’ luggage for local distribution. More and more work finds its way on the internet, but so much of that work eventually disappears, in a way that print publications rarely do. I’ve sometimes wondered if anyone still had copies of The Commuter Skim, an email-only journal edited by Keston Sutherland in the late 1990s. I used to have them on my hard drive, and maybe Keston still does, but the only place they show up on the web is as printed copies in the papers of John M. Bennett at Ohio State University. Maybe he printed them off to skim on the commute. Hard copy really is truth. 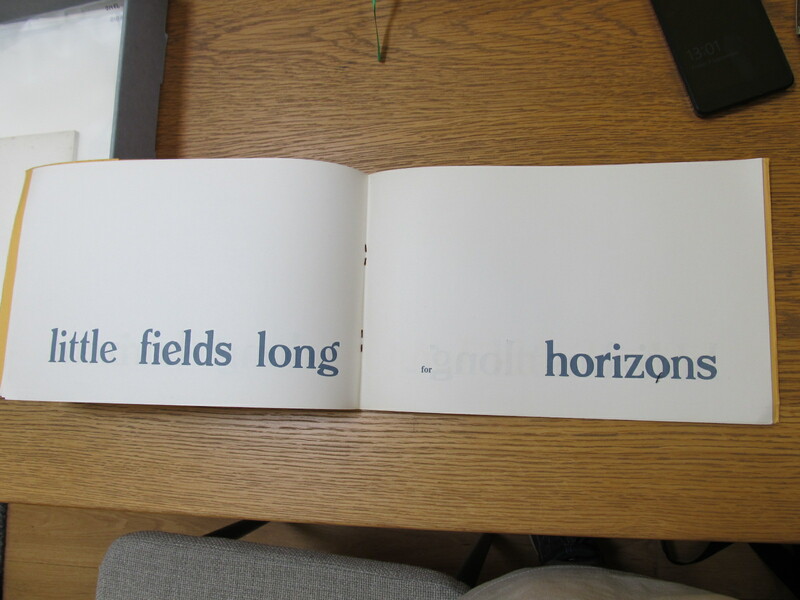 It’s a radically strange book, with minimal text, lettering and linear graphics often working together through the thickness of the page (so you can only see the complete image by holding a page up to the light). 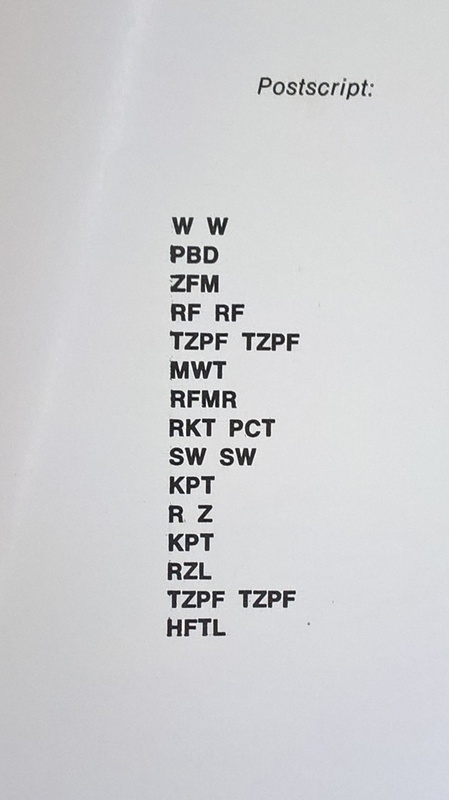 I’m now wondering if Rot(h)’s 1968 artwork P.O.TH.A.A.VFB (Portrait of the artist as a Vogelfutterbüste [birdseed bust]) might be a subtle tribute to Finlay. It’s always interesting to see how someone interacts with the books they have owned. 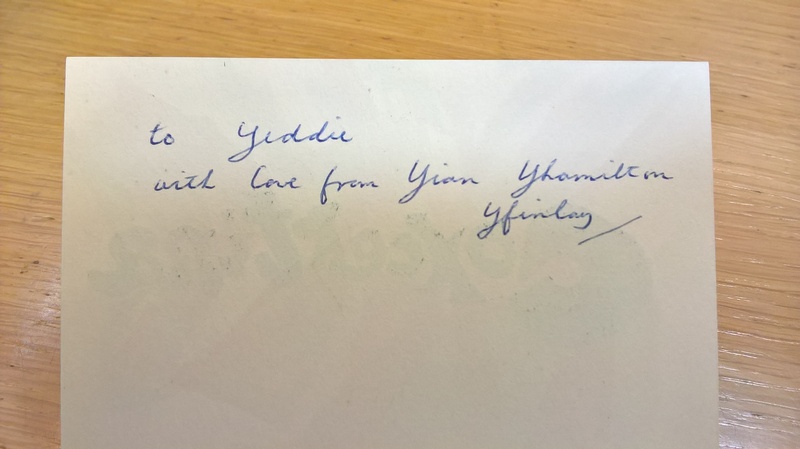 I used to sign the flyleaf of every book I bought, but stopped doing that circa 1993, when I first got into the small press books and pamphlets which are now crowding me out of the flat. I signed a few of those, then started to feel I was defacing something I shouldn’t, and I never did it again. I rarely used to make notes in the margins of my books, but when I was working on my Mallarmé translations, that turned out to be the easiest way to keep track of my reading. I only seem to do this when my reading comes to feel like research — and now I find I’m marking passages in pencil in the margins of my books by and about Ian Hamilton Finlay. 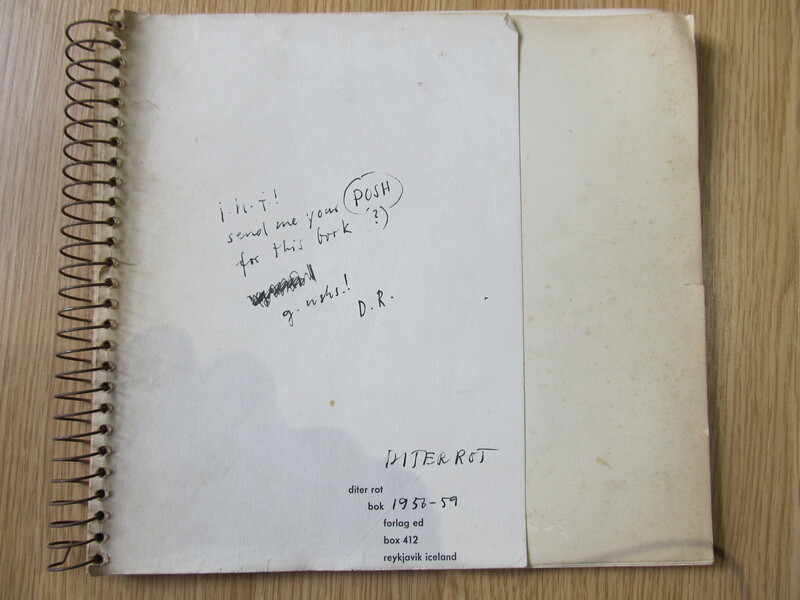 Edwin Morgan was a lifelong keeper of scrapbooks, and many of the books in the Edwin Morgan Library in the Mitchell have something of the scrapbook about them. He would often swell their pages with newspaper cuttings relating to their content, and would sometimes add small, mordant comments or question marks in the margins, or correct the typos by hand. The flyleaf of his copy of Hugh MacDiarmid’s pamphlet The Ugly Birds Without Wings has a sheet pasted on. 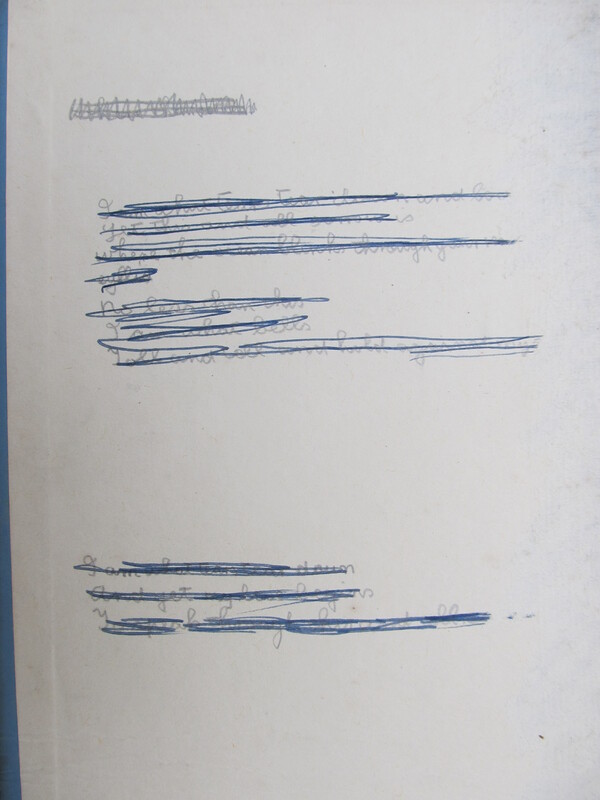 It’s cut from an auction catalogue, illustrating part of MacDiarmid’s manuscript of the pamphlet. Morgan doesn’t comment, but the page shows that MacDiarmid originally included an aside about his having been best man at Finlay’s first wedding, and about Finlay having been a guest in his house. That personal touch might have undercut the rhetoric, and it was crossed out, but Morgan puts it back in place, and so do I.
Whoever almost-wrote that (probably the young Finlay, channelling the young Graham), really, really didn’t want to see it again, or for me to see it, or you, and I know I should respect that, and leave it covered, but it’s hard not to return to this one book every time, to take another blurred photo under the library’s multiple dim lights and their inescapable shadows, to make one more descent under ink, the only kind of archaeological dig I will ever take part in. This entry was posted in sharing little sparta, Uncategorized and tagged sharing little sparta on 08/09/2016 by Peter Manson. Late in life, Stéphane Mallarmé answered an interviewer’s question by saying that he was “profondément et scrupuleusement syntaxier” — profoundly and scrupulously a “syntaxer”. I’ve either spent too much, or not enough, of my life trying to look at the world, and at language, through Mallarmé’s eyes, but a syntaxer is what I would be too. Everything follows from syntax. It makes the rhythms of spoken language possible, it makes argument possible, and if you push hard enough at it, you realise it’s unstable. There tends to be more than one possible syntactic path through a given string of words, and the more you develop an ear for syntactic instability, the more the possibilities seem to snowball ahead of you. The ambient linguistic environment tends to explode into a hilarity of linguistic pratfalls, sentences which end up meaning something quite other than their authors intended. The act of reading poetry — especially out loud — becomes a vertiginous real-time set of decisions on how to collapse ambiguity into the specific syntactic and intonational choices of this particular reading, a performance never repeatable in quite the same way. I love complexity, and I love irreducibility — the feeling that there is a thing in the world which I can never claim to know completely, even if I made it myself. I love performance, the specificity of one person’s voice and accent bringing the whole of their personal and social history to bear on an object which they bring to life for others. I love the sound language makes, and I love not knowing what I mean by that, since the phonological structure of my accent is not the same as yours, and the pattern in sound made by the same poem in our two mouths will be quite different. 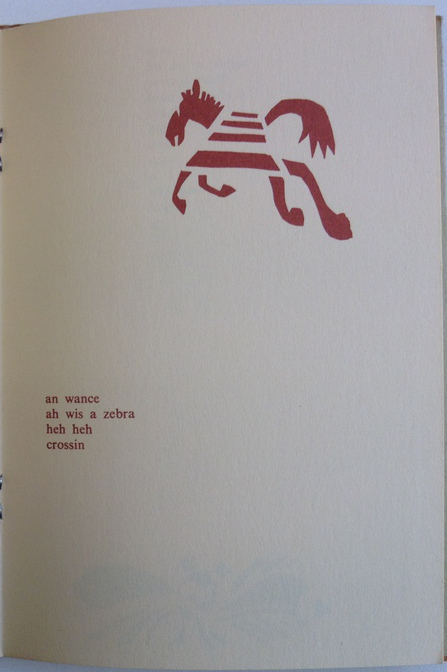 All of which is to say that I’m not really an identikit fan of concrete and minimal poetry. I’ve often felt it as an attempt to shut down possibility, to narrow the field of view to a scene where everything has its place and stands in controlled relation to everything else. There’s an element of the narcissism of small differences in this — I don’t find myself much exercised by the existence of wistfully anecdotal mainstream poetry, but when yet another generation of Scottish poets discovers the avant-garde, and it turns out to be the avant-garde of the 1950s, I want to cry. 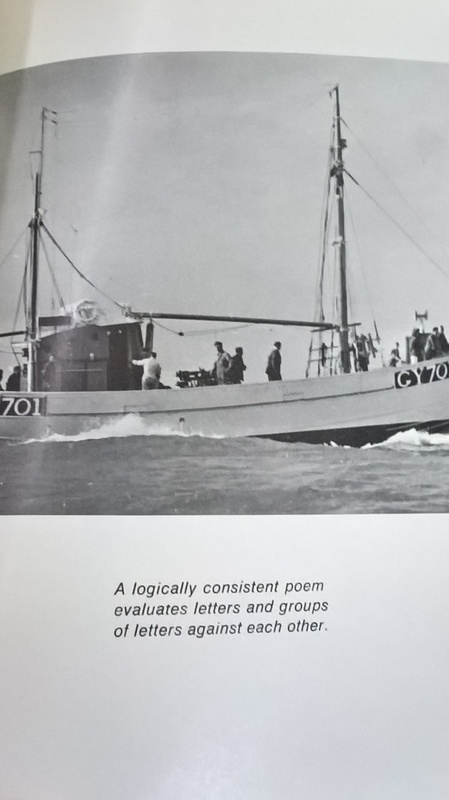 The presence in Scotland of two major innovators in concrete poetry, Ian Hamilton Finlay and Edwin Morgan, has made that art-form more visible here than it has been in most places, and more of an influence on younger poets. And so often, what gets produced here is either deliberate or unconscious pastiche of Finlay or Morgan, as if concrete poetry, at its origin the most internationalist movement in modern art, was simply another Scottish tradition. A certain rigidity in my quickstepping, once led me to dance very slowly and deliberately over a number of records, laid on the floor: that old waxen sort, which crack with a sound like remote mortar fire on a misty evening. (If you are familiar with that). It’s the gentlest imaginable shot across the bow — to have believed you were about to be bombed, and then conscripted into the war that nearly killed you, is not something most of us, in Scotland today, are familiar with. It must have permanently altered Finlay’s relationship with, and ability to trust, the outside world. And then there were the loud, angry poets: Hugh MacDiarmid’s charmless pamphlet The Ugly Birds Without Wings, attacking Finlay and his younger associates, seems an extraordinary over-reaction to the obvious gentleness and good humour of Glasgow Beasts and Poor.Old Tired.Horse. 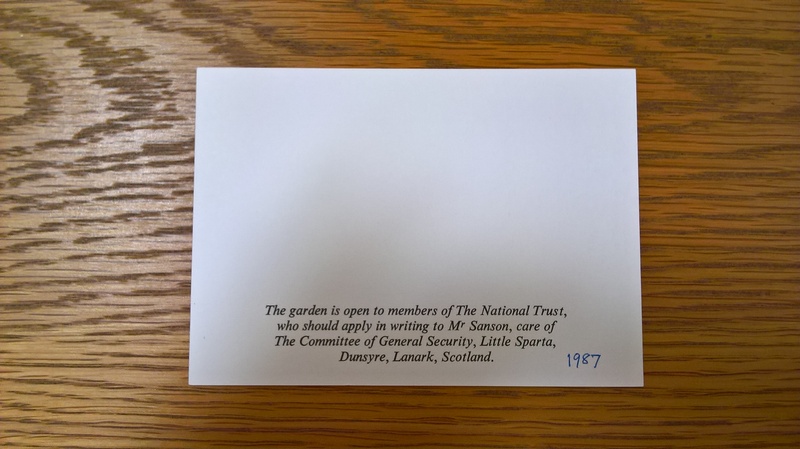 I wonder what it must have felt like to be the real person, Ian Hamilton Finlay, suffering real distress at the hands of the pseudonymic construct Hugh MacDiarmid, and knowing that there was no person there to be hurt in return. Finlay’s response was perfect: he created the rumour of a protest march and Zeppelin raid on Edinburgh, and the press and the authorities believed him. 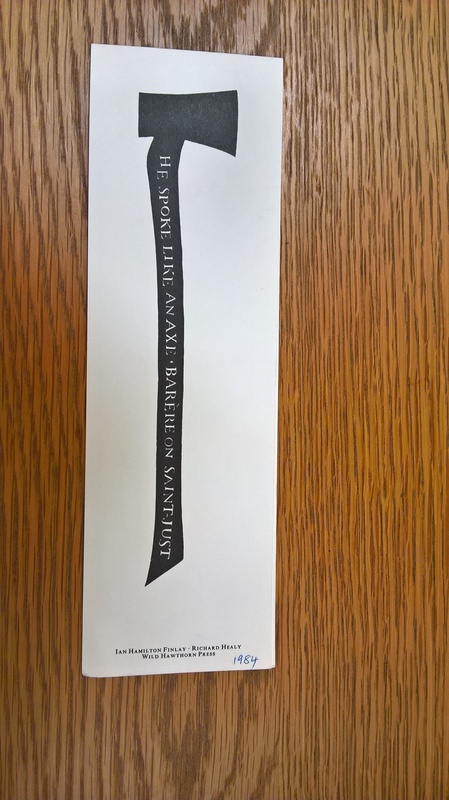 I’ve had the chance of holding, paging through, and reading a lot of Finlay’s publications in the last few weeks, in the Mitchell Library and the Scottish Poetry library, and the experience has been extraordinary. I knew a lot of the work at second hand, through reproductions or selected works, but nothing quite prepares you for the absolute freshness of the original editions. The smallness of the objects, the single small gestures made entirely separately, out on their own in a context carefully chosen for the occasion, the endless fertility of the formal imagination, the constant re-thinking and re-framing of favourite motifs over decades of work, so that new meanings accrete. I don’t think I’d ever really seen Finlay’s work before: I needed to be slowed down to something like its own pace. Even the library isn’t slow enough, you have to imagine these things arriving in the post, at irregular intervals, when nothing like them existed in the world. The kinetic booklets of the 1960s are my favourites — Ocean Stripe Series 3 (1965), its minimal text ticking over from ark to arc, then a rainbow of blank, coloured pages at the end. 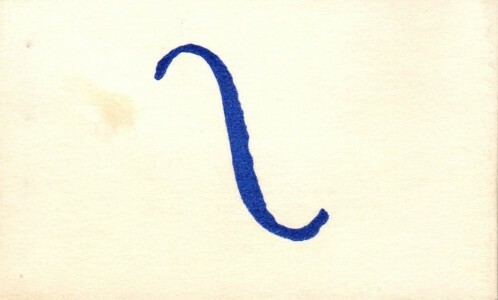 Wave (1969), a tiny flicker-book implementation of a formal theme Finlay returned to again and again in various media — the transformation of one word into another, letter by letter, using the proof-reading symbol for the transposition of letters. 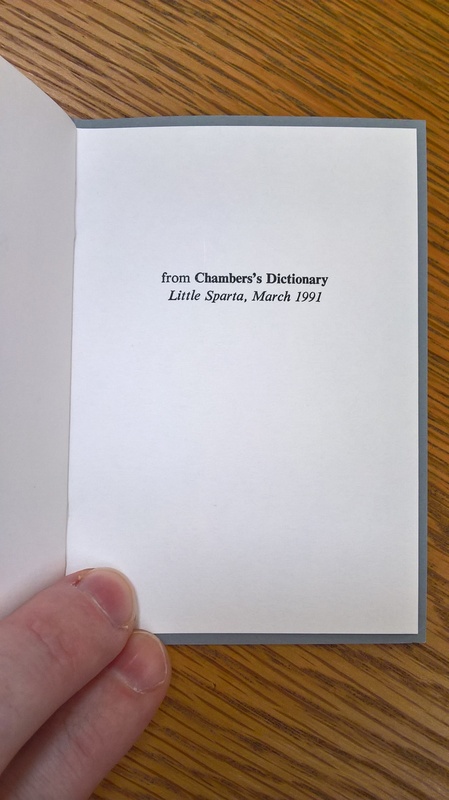 I’m fascinated and impressed by Little Sparta, but it’s these tiny books which really move me. Little Sparta was above all a place where Finlay and his family could live, and the tone is much lower-key, as if the works in the garden were reminders — I imagine the poet taking a walk in his own garden to remind himself who he is, and that he is, and the alternate solace and challenge of having all that so close at hand, outside of his head. The printed work has such an immediate, fugitive vitality — there’s colour everywhere, and a kind of absolute unheaviness that disarms me completely. Things that I might pass over as one-liners in a collected edition turn into immensely well-crafted good jokes, and slowly you realise the energy and communal labour that went into making these objects. Almost all of them were made with the collaboration of visual artists or letterers, and simply to have got them printed so well, at a time when there wasn’t really anything you could point to as a template, is an amazing achievement, more like that of a film-maker in charge of a production crew than a poet. Everyone gets a credit. It’s bittersweet to realise that research libraries will always be the only place most of us can get to see this work. Finlay did everything he could to make the work available and affordable when it was published — these things didn’t enter the world as fine art multiples, they were small-press poetry and they cost pennies or a few shillings at most, cheap enough to sometimes give away. 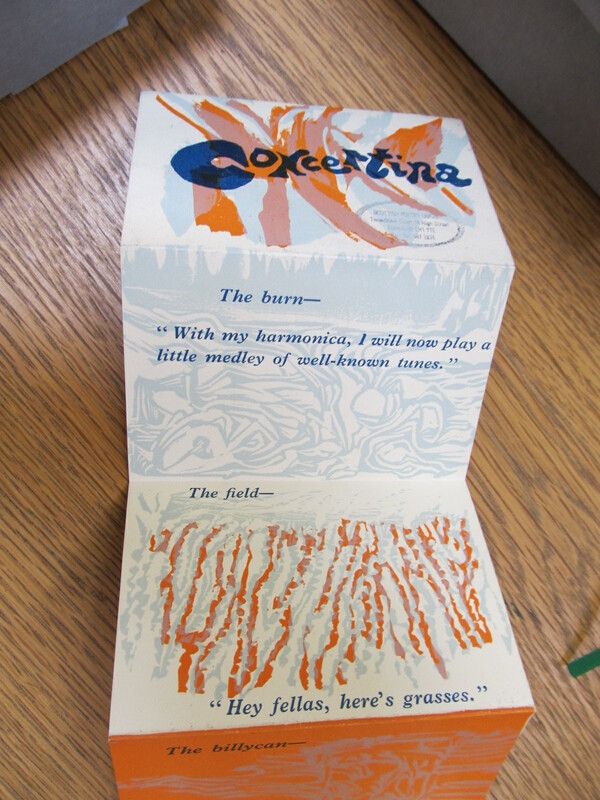 But Finlay became known as a visual artist, and the most ephemeral of his early booklets is now a collector’s item. It’s possible to interact with most artworks without physically damaging them, but you need to handle a book to make it work, and every time someone touches one of Finlay’s books in a library, it deteriorates. It’s progressive, and inevitable, and fewer and fewer people will be allowed to make Finlay’s books work as the years pass. I’m really lucky to have had such free access to them at the SPL. This entry was posted in sharing little sparta, Uncategorized and tagged sharing little sparta on 03/09/2016 by Peter Manson.